Today, I'm wearing (again) what is really the cornerstone of my wardrobe - a white or cream top with skinny blue jeans. If you look back on my outfit shots on Instagram, you'll see how much both of these items feature because they are the starting point for so many different outfits. A simple change of footwear or jacket, or the addition of a great necklace, totally transforms the look day to day. It's the basis on which I've streamlined my wardrobe in recent months and while it might not make for radically different outfit shots on the blog, it does make the business of getting dressed a whole lot easier these mornings. 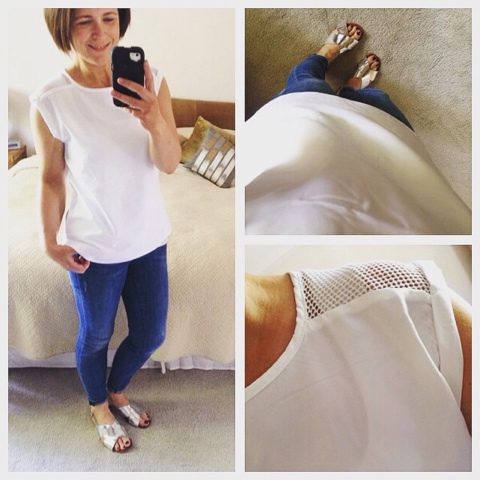 I'll cover the skinny jeans next week but on this post, I'm going to share my pick of some great white and cream tops in the shops right now. In terms of which colour to wear, the general rule is that warmer complexions suit cream and cooler complexions suit white but I'm not good with rules and enjoy wearing both. I know I suit cream better though so when I wear white ones, I always slap on a bit of fake tan and it seems to help make it work on my warmer/autumn colouring. I picked it because I liked the mesh detail on the shoulder and although it's polyester, it doesn't feel like it is. My favourite part is that it's a proper white white...bright and clean looking and it washes really well (important for white tops!). Not many left online but you might be luckier in-store. 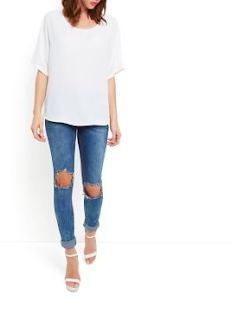 Another one of my purchases, this Hush Jessica Top, is my favourite cream top. I love the scuba type material front mixed with the grey jersey back. This has also washed really well and has the bonus of being completely opaque. 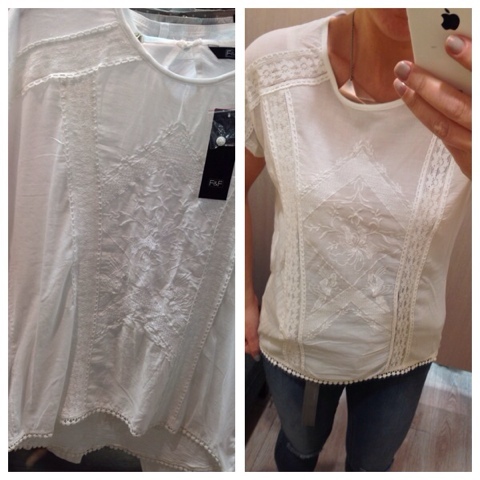 Moving on to some tops that are on my wish-list, New Look have a few gems at the moment. They really have their tops sussed at the moment. I almost always buy one when I call in-store. and Next is my current port of call for basic cotton short sleeved tops - these ones are £4.50 and come in a ton of colours and on a multi buy of 2 for £8 or 3 for £12. 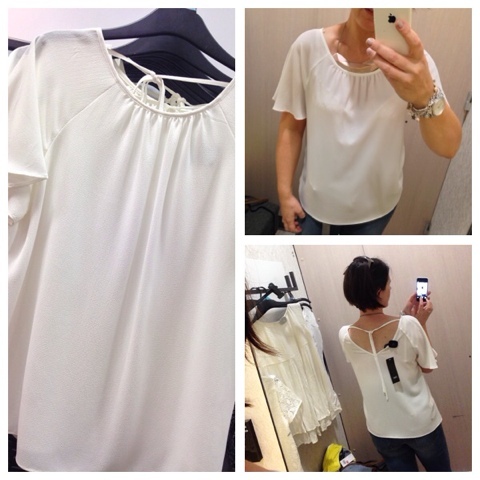 Next I tried this lovely plain top with a tie back detail. Nice fit in a 12 and lovely delicate sleeve detail. I'm not a fan of open back tops though so it wasn't for me. 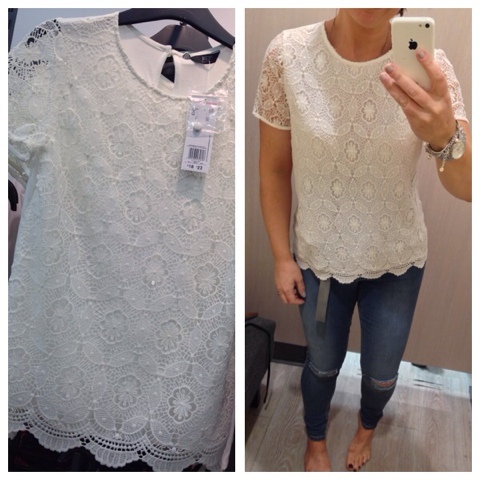 Love the pom-pom detail on this next top which has gorgeous detail for the price. It was a bit neat in the size 10 which I brought into the fitting room as the 12 looked very long. 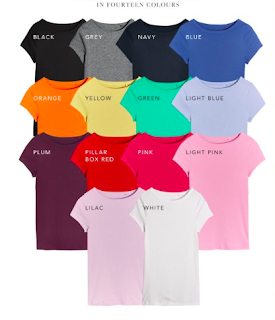 Good if you're looking for a longer line top for over leggings etc. Finally, the only one I couldn't find online - this cream lace top is beautiful. I'm wearing the size 12 and the only reason I didn't buy it is because the back of it is a light jersey material that seemed to cling a bit and didn't look very flattering from behind. Fab from the front though! Do let me know where you get your best white and cream tops as I'm always being asked about this! Hope you're having a lovely Wednesday - I'm booked in for an amazing treatment this morning that I can't wait to tell you all about. It and a cut & colour on Friday are my last pamper opportunities before the school holidays start on Tuesday and I'm going to enjoy them so much. Nothing beats this look - it's a simple yet elegant look. 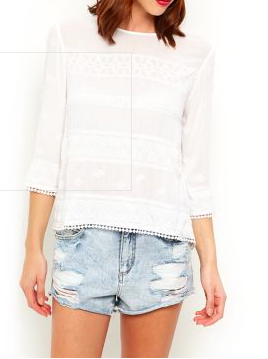 I need to add to my collection of tops like this so thank you for highlighting a few! I love this look and am permanently on the look out for white and cream tops - short sleeve for everyday wear and sleeveless for under jackets. I'd almost forgotten about F&F so am definitely going to have a little run in there during the week. 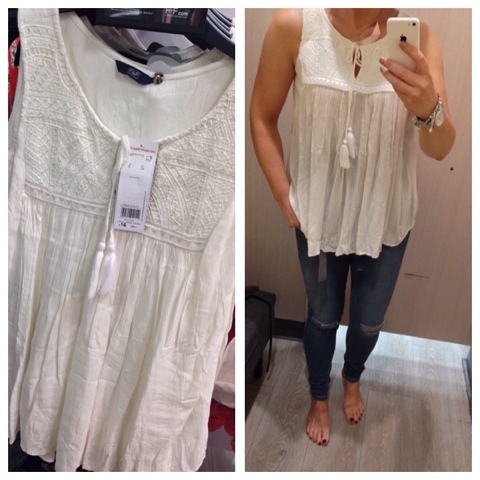 Love that boho top on you and you were so right to get the jeans! !